Photo by Dr. Daniel Krivoy, M.D. A survey by the Bureau of Labor statistics revealed that union members in the United States have much greater access to employer provided health insurance than nonunion members. Union membership has traditionally provided working families improved health insurance coverage. A recently-released report by the Bureau of Labor Statistics shows that might be truer ever, even in the face of rising costs. Union members had a higher access to employee-sponsored health insurance coverage and highest percentage of users of any group in a survey conducted by the Bureau of Labor Statistics. 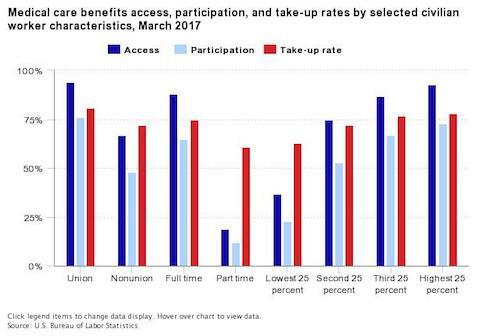 The take-up rate illustrated in red is the percentage of workers with access to a health insurance plan that participate in it. According to a survey, 94 percent of union members in the United States had access to employer-provided medical care benefits as of March of this year, compared to just 67 percent of nonunion workers. Programs like the NECA/IBEW Family Medical Care Plan are a reason why the percentage of union members with access to coverage remains high, FMCP executive director Larry Bradley said. The FMCP, which the IBEW operates in conjunction with the National Electrical Contractors Association, operates without the need for profits. It also doesn’t rely on advertising or extensive overhead that most for-profit insurers do, allowing it to provide equal or better coverage than what members’ employers were providing at a lower cost. It’s been an attractive option for companies and contractors, who increasingly are feeling pressure to move to high-deductible plans and away from traditional PPO programs. NECA and the IBEW are giving them a way to save money while continuing to provide coverage. About 165 local unions have signed up for the plan, covering about 95,000 participants. It also is being used by five Fortune 500 companies to provide insurance for IBEW members covered by a union contract, including Verizon, Frontier Communications, FairPoint Communications, CenterPoint Energy and the South Texas Project. 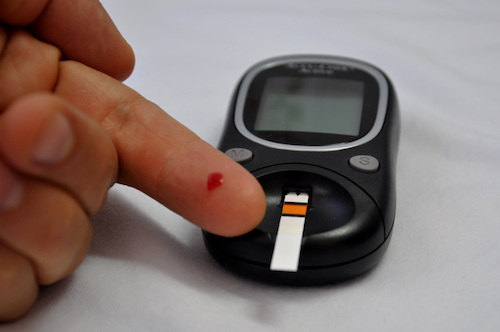 Diabetes rates for young people are rising, making testing and long-term care an important part of any health insurance plan. Overall, 81 percent of eligible union members took part in their employer-provided plan compared to 72 percent for nonunion workers, according to the bureau’s study. Bradley urged everyone to be leery of high-deductible plans that put a premium on staying healthy and providing coverage only in the case of a catastrophic illness or disease, noting that obesity, high blood pressure and diabetes rates continue to rise for young adults. International President Lonnie R. Stephenson said the survey’s results further underscore the importance of the labor movement, even while it is under attack by the GOP-controlled Congress and many of its corporate allies. “Those numbers speak for themselves,” Stephenson said. “Ensuring quality, affordable health insurance for our members has been a priority of our local unions during collective bargaining for generations. The plan was started in 2006 for construction locals and has expanded into multiple branches of the IBEW. Local unions interested in finding out more about how to get an FMCP quote for members should contact the FMCP at (301) 556-4300 or visit www.nebf.com/fmcp.